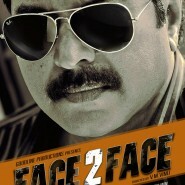 Face 2 Face - Mammootty - Malayalam Movie | Mammootty Online.com - All About Malayalam Megastar Mammootty ! Mammootty will be doing the role of Balachandran, who was appointed for the investigation of silent murders occurring in the midst of modern urban life. As the name suggest the movie has been bringing life and death face to face. Siddique, Kunjan, Vijaya Raghavan, Rajesh Hebbar, Vineeth Kumar, Kalabhavan Mani, Nishanth Sagar are doing other important characters of the movie Face to Face. Along with experienced stars the movie face to face is featuring with 4 new faces. Roma will be doing the female lead along with a fresh faces. Manoj has penned the story and Ajayan Vincent has made the visualization of the movie face to face. Goa, Ernakulam and Munnar will be the shooting location of latest Mammooty flick face to face. Alphons has tuned the music for the lyrics of Sarath Vayalar, Anil Panachooran & Jophy Tharakan. Nasar has produced the movie face to face under the banner Good line productions.